I enjoyed quite a few blackberries this summer – In the UK, you can find them wild pretty much everywhere, just like elderflowers. Our friend’s allotment is surrounded by these thorny bushes so I go there to pick some whenever I want – you can enjoy them for a while as they ripen gradually. If I had to pick a favourite from all the tempting summer fruit recipes, though, I might choose the sorbet – the intense flavours from all the berries/currants, the dark rich colour – it’s just irresistible! I always try to churn an extra batch for the winter but it never survives that long, it disappears so quickly every time I make it. 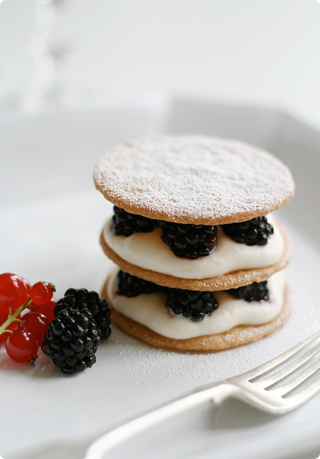 This little shortbread tower recipe is from the Claudia Fleming book – sandwiched by the crumbly shortbread biscuits (scented with grated orange zest) are blackberry puree, fresh blackberries and créme fraîche scented with orange-blossom honey & orange-flower water – all of which add a subtle but refreshing, distinctive flavour. You can find a similar recipe in Christine Manfield’s Desserts, which is paired with lemon cream instead of orange. You can’t resist this if you’re a raspberry fan – I was just happy with the melt-in-your-mouth white chocolate mousse with the berries, but the raspberry milkshake (raspberry liqueur and coulis at the bottom, milkshake (coulis and milk blended together) on the top layers) really makes the most of fresh raspberries. I made lemon biscotti to accompany it. The recipe is from Formulas for Flavour. I always love making charlotte and found a tempting recipe in the wonderfully comprehensive The Cook’s Book where Pierre Hermé writes the dessert and pastry sections. Such talent and beauty through your creation and the lens..
Keiko. You’re such an inspiration and model to learn from! Absolutely amazing - your talent for baking, displaying and photographing leave me in a tizzy! As blackberries are considered pests here and destroyed almost anywhere they decide to grow, the only place I can ever seem to get them are in supermarket punnets. 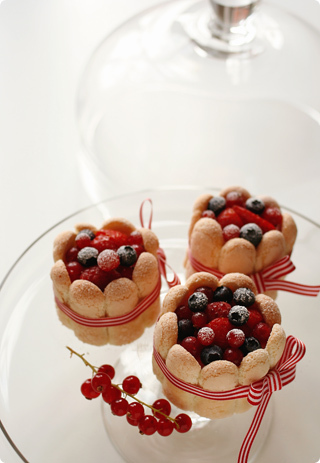 I especially love those little charlottes, and think that I’m going to have to give them a try myself! 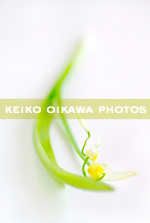 Love the photos Keiko! I am especially inspire by the raspberry milkshake! Thanks for the post! 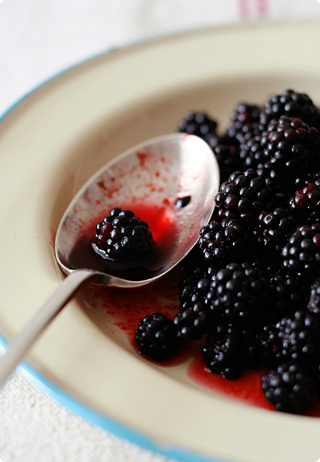 I adore blackberries! Unfortunately they are rather difficult to find in Spain. They´re frozen and tasteless. Living in the country is the only way to get them. Beautiful pitures ... as always!!! Waouh! Everything is always so nice here! It’s amazing! oh my goodness! so many beautifully delicious ways to enjoy the summer fruits! i would expect nothing less from a master such as yourself, keiko. although i’m sad to see the summer fruits go, i’m sure we’ll see all sorts of lovely fall goodies coming out of your kitchen soon! Cheers! I’m speechless, your desserts look staggering! And I thought that I had the most wonderful dessert in France in the Provence (a millefeuille aux framboises), but the most beautiful desserts are on your table! Hi Keiko, I finally made it to the Idemi shop and tried THIRTEEN of his cakes. They were all so good. I even recognized a couple of the ones you’ve made. I only wish I could’ve taken photos. I didn’t know I was a raspberry fan : I’ve learnt something today ! thanks ! Your pictures are fabulous, as always , and the recipes look great. I claim the rare honour of being first to comment on your splendid fruit desserts. Beautiful as ever. Please load all puddings on to a dessert trolley and wheel them over to Ealing! Simply stunning. You really capture the essence of summer in your pictures, words and desserts. Keiko, What a way to end the summer! 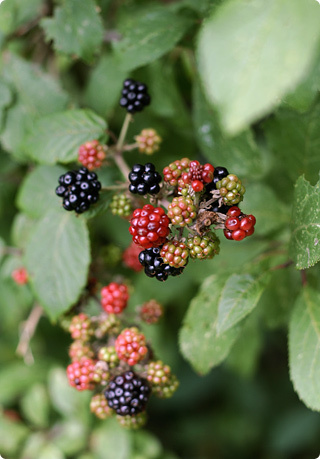 All your desserts look fabulous (as usual)...in Vancouver (and all over BC) we are also lucky to have blackberries growing wild...in most empty lots or other wild bits... they grow like weeds. Unfortunatley, with all the development going on here, they are getting more scarce. pretty little ones they are. really, well done. Your desserts always look amazing! I’m so yearning to try one of them. anyone! Keiko, why must you cause me to turn into this drooling mess everytime I come to your site? 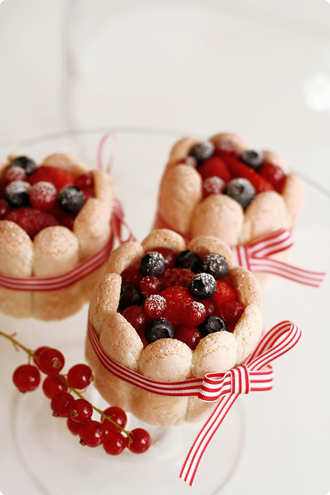 These are such wonderful applications of summer fruits. You have indeed created a great send off to summer and I am sure you will be getting on to welcoming autumn soon. Can’t wait to see it. can u make a wallpaper with this image please? I’m so glad you managed to squeeze in another summer fruit post, everything looks so detailed! What a beautiful scrapbook of summer. Adore your perfect work as always! You are a true inspiration! These desserts are beautiful! Beautiful Keiko. I do love those charlottes and may try to make them myself. this whole post looks sooo good(!) mouth-watering! Hi Keiko, the little charlottes look really cute and delectable. You are really so talented. I love all your pastries. Just wondering, could you send me the recipe for the chocolate glaze(made of cocoa) you used in ambrosie? My bf’s birthday is coming up and I really want to bake him a chocolate cake covered with chocolate glaze. And yours looks really shiny and beautiful! I’ve been wondering what you’ve been up to! I’m in Florida and the summer berries are long gone (the stone fruits are still around, but their quality has deteriorated). That post was a gorgeous wave good-bye at summer. I have no complaints about all your berry desserts, but I look forward to what autumn brings...how about some chocolate?? Wow keiko ,it looks so good ! The berries look so fresh and the color is so alive I could almost taste it. Hi Keiko, tes créations sont chaque fois plus belles ! Comment est-ce possible ? Tu as fait des merveilles avec ces fabuleuses couleurs de fruits d’été. Merci. Hi keiko, it’s me again, Veronica. I added you to my food blog link over at http://kitchenmusings.typepad.com . Hope you don’t mind. Simply stunning! All of your desserts look to good to be true. These would be perfect for a 4th of July party here in the states. Unfortunately, picking wild blackberries is not ever going to happen in Manhattan. I’ll have to rely on Whole Foods. As always, your creations look amazing. I wish I could taste! and my eyes have popped out of their sockets! What beauty you bring us each day! Whenever you do a book PLEASE LET ME KNOW!! ...gee I wish i could live in your kitchen! I’d like to try one of each right now !! Amazing pictures coupled with fantastic recipes, that’s always a great pleasure to come and visit your blog. Keiko, berry special. Love the idea of the shortbread tower and the milkshake. I love I love I simply LOVE everything you have right here! It’s such a pity we don’t have the luxury of having all kinds of temperate fruits here. Beautiful work! beautiful photography and those little red bowed wonders topped with such a great combination of intense reds and blacks ---- ahhh, totally awed! Oh, you love Pierre Hermé like me, he’s a genious ! And your charlotte is gorgeous ! Absolutely beautiful photographs, as always. It’s always sad to see summer leaving, but autumn is just as excellent for foods. It’s only at the end of winter when we are all longing for summer again, bored with all the cold weather! your pictures (and recipes)are still amazing and gorgeous ! beautiful! keiko - i tried to email you but my email client doesn’t work. would you mind writing out your full email address because i can’t see what it is with my email client not opening correctly on my computer. thanks! I arrived via Tongue in Cheek, and I’m so glad I did! Just beautiful. I like the little shortbread tower! Looks yummy! Hi! I’m a budding food blogger. I think your site is incredible! I hope you don’t mind that I’ve linked your site to mine. So whats cooking? Missed your posts a lot! The charlottes are gorgeous! Beautiful Picture! I added your link to my blog. Your website is so beautiful. I want to share with my friends. Hi, I love the pictures you posted on your blog. I’m very curious where can I get the recipes for these beautiful creations? If they’re in the book, how can I get it? Thank you so much for all your kind notes. Hi A – I’m not sure why you couldn’t email me but I hope you received my message a while ago. Hi Bertha – I always note where the recipes come from (ie book titles), as for the Japanese recipes, I simply don’t have time to translate them – will try when I can. Hello Keiko-san, I just stumbled to this post, & oh yeah, I’m sooo glad I did! The charlotte cake looks beautiful indeed! Your post has given me the idea of selling charlottes at my stall (with baked middle – not with cream/ mousse inside because it’s an outdoor market with no refrigerator!). Although I have berry-tarts on my stall already – So do you have any suggestions as to what else could be used as the topping?? Beautiful photos and great blog!! 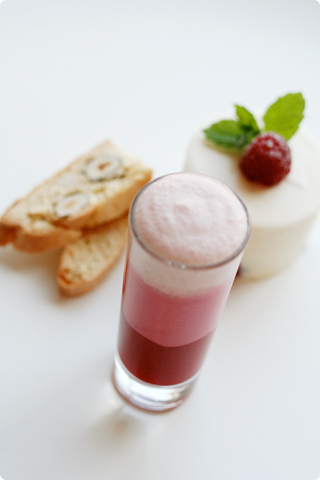 Tamami-san – your cakes always look beautiful and delicious, how about adding some cheese (ricotta, mascarpone etc) into the filling…? Priscilla – as I noted in the post, the recipe is from The Cook’s Book, it’s a great book and it’s worth buying if you are interested. Hope you had a lovely time on your boyfriend’s birthday! I discovered your blog today and I am spending my entire Sunday reading everything you have posted and already bought four of the cookbooks you like. You are amazing! I now feel like cooking all day. You have inspired me to change my favorite recipes and give them a new twist. Are you a Chef? I cannot seem to find your biography so far. Thank you for a wonderful blog, it has been a dream. Hi Katy – thank you so much for your kind note, no I’m just a keen home cook :) Hope you’re enjoying trying new recipes from the cookbooks! I’ve stumbled on your site today and what a lovely refreshing surprise it was. I am a fine dinning chef in London and am always looking for new and exciting things to try. I admire your skill and love for food. Can’t wait to try out some of these recipes. Keep up the amazing work. And THANK YOU you’ve truely inspired me to do better.